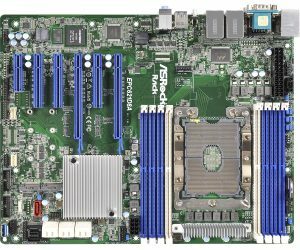 If you are building a home server for running serious workloads on-premises, we recommend a pair of Xeons and Socket FCLGA3647 Motherboards to run them. Also known as Socket P, these motherboards use high-performance interconnects to support Dual-Socket Xeon CPUs and is currently the best alternative to AMD’s EPYC CPUs. To find out more, read along. The Purley Platform from Intel has introduced a new socket in the form of LGA 3647. The socket will be supported on the Skylake processors from Intel. 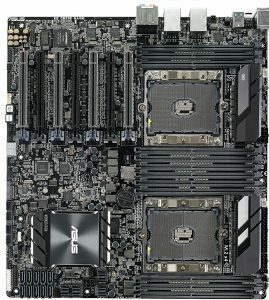 Specially designed for use with the server backed motherboard, it is quite large enough compared to the LGA 2011-3 socket. Now, which motherboards do support the LGA 3647 socket, we will check out the options we may have at our disposal. Well, before we can move on to explore the motherboard that features the LGA 3647, we will first make an attempt at understanding the concept and functionality of the socket. The socket LGA 3647 does not support latches and thus opts for a different cooling mechanism. The coolers are secured to the top of the socket utilizing screws. These are generally used in the form of passive heatsinks that are cooled by the ambient airflow inside the server rooms. The standard processors supported by the LGA 3647 include Xeon Phi x200 (“Knights Landing”), Xeon Phi 72×5 (“Knights Mill”), and Skylake-EX and -SP (Xeon “Purley”) microprocessors. A few features that it supports include a 6-channel memory controller, non-volatile 3D XPoint memory DIMMs, Intel UltraPath Interconnect (UPI), as a replacement for QPI and 100G Omni-Path interconnect. Do note that the LGA 3647 supported motherboards are designed specifically for the management of servers and workstations. That would indeed make the availability of your options quite limited. 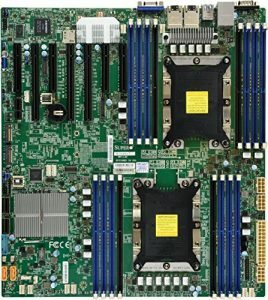 The Supermicro X11DPH-T Dual LGA 3647 Sockets Motherboard comes under the category of Dual Intel Xeon Scalable Processor Motherboards. Offering a maximum TDP of 205 Watts, it comes with 16 DDR4 DIMM slots. Support for Intel® C624 Chipset. The motherboard supports Dual LAN with 10GBase-T with Intel® X557. This is a C624 Chipset based dual socket motherboard suitable for Intel’s Xeon line of processors. It means that, technically, you can use a pair of Xeon Platinum 8176 processors, which provides 28 cores & 56 threads each, with a total of 56 Cores & 112 Threads and 432GB of system memory. Manufacturer Super Micro Computer Inc. This is also an E-ATX form factor motherboard. Also, some aspects of the layout are different than a standard ATX system, and you might need to make some modifications to complete the assembly. There are plenty of customization options in the BIOS, and we highly recommend to update it to the latest. Also, we recommend using low-profile DDR4 memory, since there are space limitations for DIMMs with taller heatsinks. The GIGABYTE Extended ATX Server Motherboard is one of the excellent options for all your needs in workstation motherboard needs you may have. Belonging to Intel Xeon Processor Scalable Family, the motherboard supports Intel Xeon Platinum Processor, Intel Xeon Gold Processor, Intel Xeon Silver Processor, and Intel Xeon Bronze Processor. The LGA 3647 sockets have been specially designed and optimized for the server and workstation management. There are not many motherboards based on these sockets. 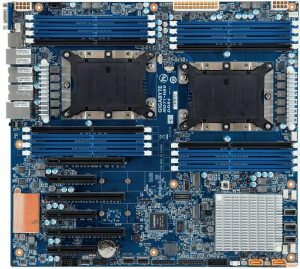 In fact, Supermicro has been actively involved in the manufacture of the motherboards with the LGA 3647 socket. The motherboards with LGA 3647 sockets support the latest Intel Xeon scalable performance processors based on the Skylake SP architecture. We have only covered only a select few of the motherboards in this compilation. The list here is representative in nature, and you should be able to find a few other options from Asus, Supermicro, and ASRock. 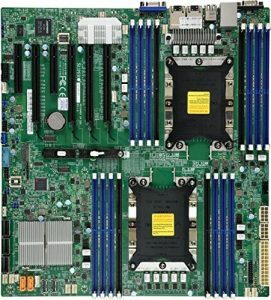 Have you used any of the motherboards with LGA 3647 socket for your server and workstation management? If you have used any of the options among those featured above, do share your views and experiences with them. You may also share your experience with any other motherboard with the LGA 3647 socket. Your inputs would help our readers and us in making the right decision when choosing the best options for our server motherboards. 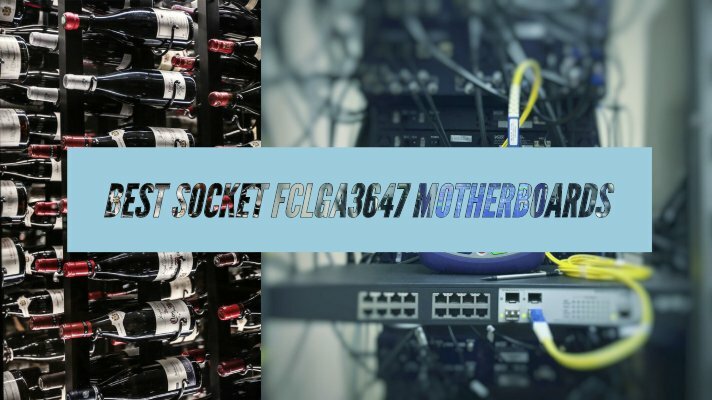 For now, these are the only Socket FCLGA 3647 motherboards available, and those we thought were worth mentioning in this post. We will keep you updated as there are new models available, so make sure you subscribe to this blog for regular tech updates. If there is any query on your mind or anything you want to suggest, feel free to leave your comment below or contact us directly, Thank You! See you until next post.